I thought it looked like a super rocket so I contacted Bill and he was happy to post one off to Australia and it arrived within a couple of weeks. First impressions is that this is a good solid kit. 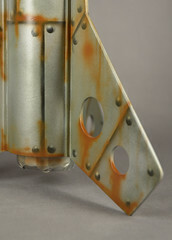 The 54mm body tube is solid and has a very tough nose cone. The centering rings are 4mm ply and the fins are 3mm ply. The instructions are straight forward and even describes how to do internal fillets - something that you'll want to do as externally, there's some strips of basswood that go between the body tube and the fins. I used an Estes 29mm motor retainer (for the price, these are great value). I swapped out the supplied launch lug for rail buttons and attached the shock cord to the forward centering ring with a screw-eye. I had a lot of fun building this kit. 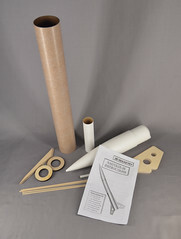 View the full build thread on The Rocketry Forum and the photos on Flickr.